In five states, Small and Medium-sized Enterprises (SMEs) produce more than 50 percent of known exports for the state. This month the International Trade Administration released its overview report on U.S. Exporting Companies in 2011. This overview is based on the Census Bureau’s Profile of U.S. Importing and Exporting Companies, 2010-2011. This report, a joint project between Census and the International Trade Administration (ITA), details the characteristics of U.S. merchandise trading companies in 2010 and 2011, including information on company size, industry, geographic composition, and top export markets. The report shows some interesting data and helps show how services like those offered at ITA can help Small and Medium-sized Enterprises (SMEs) begin exporting or increase their exports. Businesses of any size can contact their nearest Export Assistance Center to find out how we can help. In 2011, more than 300,000 U.S. companies exported goods, an increase of more than 8,200 since the previous year and up by more than 25,600 companies since the beginning of the National Export Initiative (NEI) in 2009. Manufacturers accounted for the largest portion of known export value (that is, export transactions that can be linked to a specific company), much of it from large firms. However, when you look at the number of exporters, manufacturing firms only account for about a quarter of U.S. exporters, with smaller and medium-sized firms accounting for many of the non-manufacturing companies. In fact, SMEs, which have fewer than 500 employees, accounted for 98 percent of U.S. exporters in 2011. With regard to markets, exporters largely ship goods to markets in North America (namely, NAFTA partners Canada and Mexico), with 43 percent of exporters shipping merchandise to this region. The number of companies exporting to the Pacific Rim region has also shown significant growth in recent years, up by more than 12,000 since 2009, nearly all of which were SMEs. Among the top 25 U.S. export markets in 2011, the number of exporters to Australia showed the highest increase, up by nearly 2,700 exporters since 2010. SMEs account for a third of goods exports on average, but in markets like Switzerland, Hong Kong, the United Arab Emirates, Turkey, India, and Israel, SMEs account for more than 40 percent of known U.S. exports. On a state level, California reported the most identified exporters in 2011, at more than 75,000, followed by Florida, New York, Texas, and Illinois. 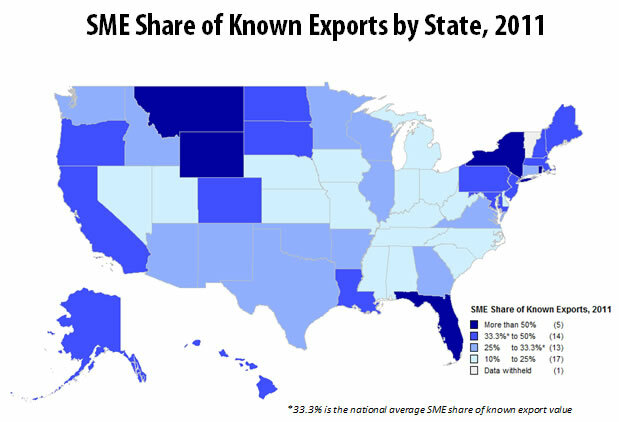 SMEs play an important role in many states’ exports, in particular accounting for more than half of goods exports from five states, which includes the states of New York and Florida, both among the top state exporters. Overall, SMEs in particular would benefit from further expanding into new markets. In 2011, more than half (59 percent) of SMEs exported to a single foreign market. In contrast, 55 percent of large companies exported to five or more countries. Compared with big companies, most SMEs do not possess offshore business affiliates that can be used to circumvent trade barriers and gain market access. That’s why U.S. government initiatives to open foreign markets can especially benefit smaller U.S. exporters. If your SME needs help gaining access to foreign markets, you can contact your nearest Export Assistance Center to find out how we can help your business, regardless of its size. For more information, read the full overview.